Natural England works with a variety of partner organisations to help put in place legal agreements to secure areas of Green Infrastructure (GI). They are required to report on the location and area of GI to Defra. The actual boundaries of the cases were not centrally mapped, so Natural England required that the GI boundaries were mapped in a Geographical Information System (GIS). Over three separate contracts between 2012 and 2016 exeGesIS collated maps of GI delivery and captured the information, which was supplied in ESRI ArcGIS format. Maps were collated from local planning authority websites or the relevant Natural England casework officer. Collated maps were registered in GIS and areas of UK Biodiversity Action Plan habitats and other GI were separately mapped and attributed. In total, 753 cases were mapped amounting to 3,485 polygons (21,342 ha). 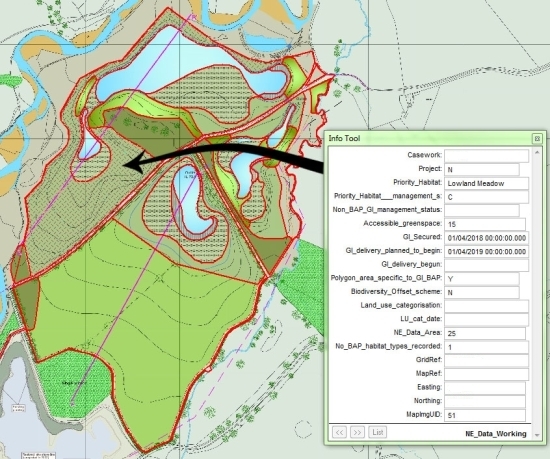 As part of the first contract, the dominant land use was also extracted from Land Cover Map 2007 to indicate the habitat present prior to GI delivery. Brief reports were produced detailing the process and results, and summarising gaps in the information where maps were not available.